For players age 8 to adult. 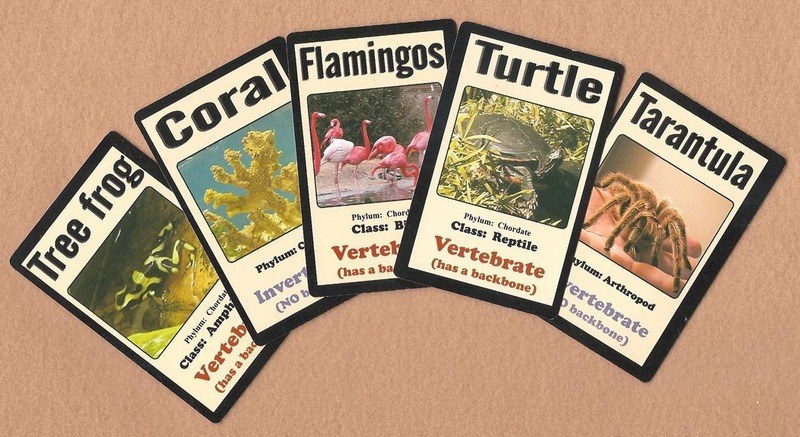 The object of this game is to collect one of each class of vertebrate (one mammal, fish, bird, amphibian, and reptile) OR one of each of five different phyla of invertebrates. The deck consists of 25 vertebrate cards and 29 invertebrates (arthropod, mollusk, cnidaria, echinoderm, porifera, and annelid). - Deal five cards to each player. - Put stack in the middle face down (draw pile). - Turn up one card (discard pile). - Player 1 picks one card from the tope of the draw pile OR the discard pile. - Player 1 then discards an unwanted card face up onto the discard pile. - If Player 1 has collected one of each vertebrate class OR one of each of five different invertebrate phyla, he/she wins. Otherwise, it is the next player's turn. - Continue until there is a winner.